The self help book industry preys on those who seek quick and efficient ways to adjust and improve their current lifestyles. I am guilty of being one of those people... #sorrynotsorry. Because I am a psychology nerd, I picked this gem up a few months ago at a bookstore, hoping that it would be not only interesting, but also instructive for my personal life. My gateway into the lifestyle improvement literature began with The Happiness Project by Gretchen Rubin a few years back. Although I don't remember every little detail of the book, I do remember that it made me significantly happier to read about her happiness project. For those of you who have not read this book, I'll give you a quick summary. Basically Gretchen takes out an entire year of her life to improve specific parts of her existence like her marriage, kids, career, exercise, etc in hopes of finding what most of us do indeed hope to find eventually: happiness. I won't spoil whether she actually did succeed, for those who haven't read the book, but I don't really think that was the point. These self help books won't change your life instantly. Change involves a great deal of work and time. Books like The Happiness Project or 59 Seconds: Change Your Life In Under a Minute are just the stepping stones to realizing that the road towards happiness is possible and maybe easier than we think. These authors basically outline various methods to change in hopes that the reader may take two or three things to heart and start their own journeys. 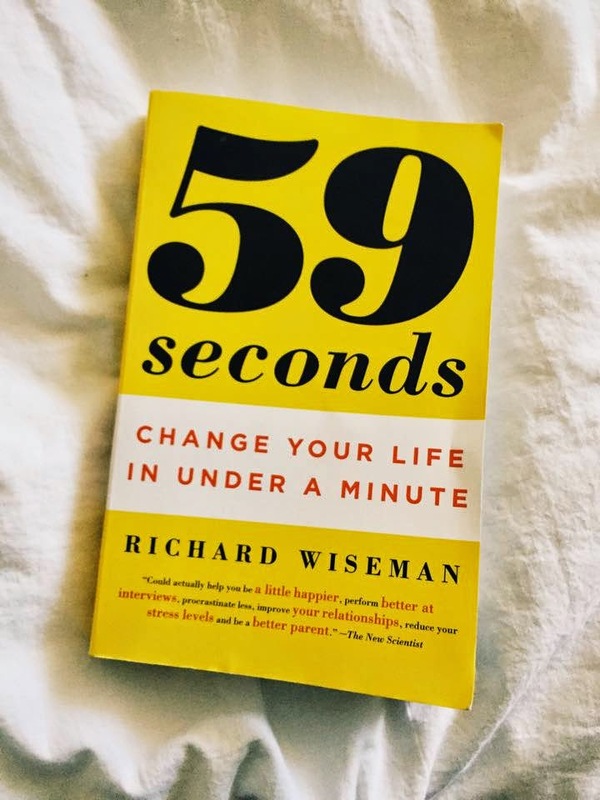 Richard Wiseman, author of 59 Seconds: Change Your Life In Under a Minute, took a more psychological approach to lifestyle progress. For those of you who are not interested in psychological experiments or the "science" to self help, then you may want to just skip to the conclusion page. Wiseman is thorough in his approach to proving why his techniques should work which is nice because I definitely believe him, but it sometimes can be a tad dull. There are 10 chapters on various topics like happiness, persuasion, motivation, creativity, and more. Each chapter has a few techniques that you can do to improve these things in under 59 seconds, supposedly. These techniques are usually very simple like hanging a mirror in your kitchen so you don't over eat or buying a potted plant for the office to help the flow of creative performance. Overall, I find these quick fixes fascinating and actually very effective. They are not only scientifically proven to work, but also easy as hell. My personal favorite chapter was "Personality" at the end. I'm always a sucker for a good personality quiz (check previous post here) so obviously I fully enjoyed reading his tips on this topic. Did you know that according to one psychology theory called "The Big Five", there are only 5 labels that make up a personality? Easily remembered as OCEAN, they are openness, conscientiousness, extroversion, agreeableness, and neuroticism. He includes a quick test in the book that assesses your position on each label. I mean, there are also a billion personality quizzes on the internet that are free, but I like his writings on the subject. All in all I found the book very rewarding and insightful and for those of you who like self help books with a sprinkle of science, I highly recommend it. If you do pick it up and read it, let me know what you think! P.S. A friend informed me that I MAY OR MAY NOT be psychic in regards to my Silver Hair post a few days ago. I would just like to say, I did not know that Rihanna would be sporting silver hair in her new American Oxygen video when I wrote that post. I could just be the hair whisperer. You never know.